These characters hit an emotional point so dangerous it triggered a dark evolution in their Digimon- Taichi, Takato, Masaru, Hikari. These characters came to the difficult realization that the only path forward was to kill someone they care about- Masaru, Taiki, Haru, Meiko. In both lists, one entry feels out of place. In each of the first three cases, it’s the central protagonist in a pivotal moment, reshaping the story through either an emotional mistake or a tragic acceptance of reality. Here it’s the two newest digidestined on the active roster providing such intense acts at practically the same time. Before summoning Gozer the Destructor, Hikari telling off Homeostasis was a powerful moment, made moreso by her prior talk about having faith, and her ability to read the Digital World. For all the power Homeostasis has given her, she rejects it as soon as it speaks of the need for sacrifices. She witnessed all the sacrifices she needed to six years ago, and the thought of her own body and voice being used to push such a thing was the last straw. At the same time, it’s been part of her for so long that fighting it off couldn’t have left her in great shape for what she’d eventually witness. But she’s not the only one that has beef with Homeostasis. Of course everyone’s insulted that it would abandon the digidestined and bring in Jesmon, but Daigo remains the torch-bearer. Despite being leader of the original digidestined, Daigo seems to exist to be jerked around. Maki won’t listen to him, the bureau keeps him in the dark, and now Homeostasis regards its first leader as old and busted. Sensing that Maki’s eluded his grasp, these kids are all he has left to be a digidestined for, and he refuses to let Homeostasis dismiss them the way it did his group. His actions and his sacrifice won’t go down as more notable than Taichi’s, Meiko’s, or Hikari’s, but he ends up in the same boat as Taichi and that’s both not a coincidence and awfully useful given what needs to happen next movie. Daigo yells out that the digidestined aren’t pawns of Homeostasis, again attacking the core mechanic of some entity choosing kids to save the world. No matter how benevolent the mission may be, the moment the entity stops recognizing the free will of the children, it’s a relationship that has to be labeled abusive. It relies entirely on the digidestined to have blind faith in the reason they were chosen. Even without Homeostasis involved, parts of the selection process in every subsequent season raise serious ethical questions about this dynamic. The blind faith and hope the digidestined conditioned themselves to have are now working against them, as they insist that Meicoomon can be saved, believe she’s still looking out for Meiko based on vague evidence, and stand for unity and friendship because that’s all they’ve been able to count on. Mysterious Man reads all of this, as it probably has since before tri. started, and in their refusal to be pawns of Homeostasis, the digidestined become pawns of Yggdrasil. Meiko realizes she needs to break this. For all the love she has for Meicoomon, she’s not hampered by nostalgia of her fantastic adventure with her. She sees her partner for what she now is- a rabid animal that needs to be put down. She wants it done the right way- soothing her as she dies at the hands of her trusted friends independent of Homeostasis. By making the call, even if Meicoomon is saved or reborn in the end, Meiko proves worthy of being in the same conversation as Masaru and Haru who saw what needed to be done. The others, in the same way that they refused to ask Meiko the hard questions in Confession, remain stuck in their eternally hopeful illusion where everything will work out fine. 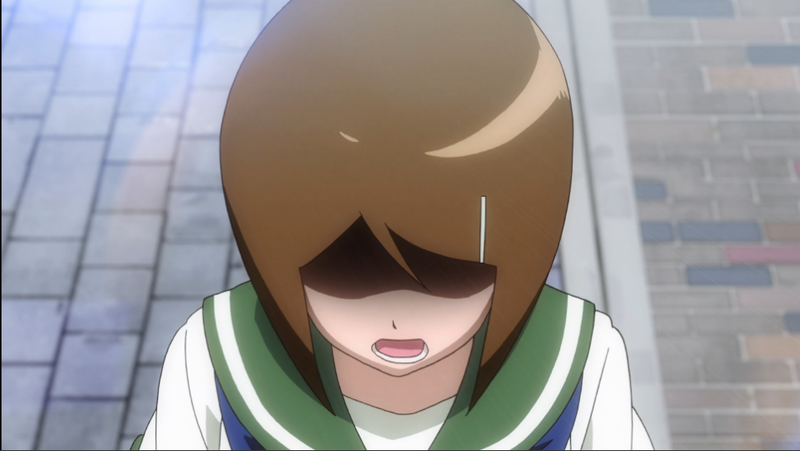 Taichi’s agreement, despite much yelling and another possible fistfight with Yamato, comes from understanding Meiko struggles to make difficult choices. He knows she must have put tremendous thought and bravery into making the hardest one possible. Of course, it all goes to hell before Omegamon gets a chance to carry out his orders. Jesmon opens up the earth, and Taichi uses Omegamon to ensure Yamato and Meiko’s safety at the expense of his own. The ensuing quiet as the digidestined watch in shocked silence is more intense than any tears or screaming. And we finally realize why we never saw Hikari’s problem: we knew what it was from her very first episode. For all the courage she’s shown over the years, deep down she’s always been the little girl who wouldn’t let go of her brother’s hand when he had to rise out of her world. It’s never been the healthiest thing, and for all the times Taichi worried about Hikari, that expectation and comfort convinced her she couldn’t survive without him. Now, weakened by battle, emotion, and fighting off the entity hiding in her mind, watching her guardian and the one thing she cares about most get swallowed up makes everything meaningless. This proves to be the switch Koushiro hypothesized. And now, with a digidestined providing the last ingredient needed to conquer the world, it’s clear Yggdrasil had been manipulating them the same way it had manipulated Maki. Not only is Daigo in prime form protecting the kids, but his flashback to his own happier moments with Maki and Bearmon are heartbreaking. We never saw it, but with stuff like that, you realize he and Maki had all the same experiences and have all the happy memories from it... and here’s where they are. One of the key missing pieces was the question of whether the digidestined were part of Yggdrasil’s plan. With Ordinemon’s arrival switching on the global attack, clearly they are. 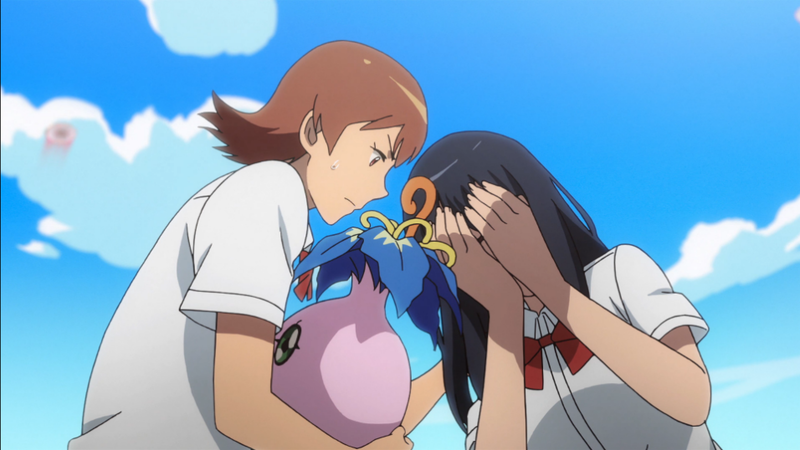 While the precise circumstances of triggering Hikari into a dark evolution weren’t necessarily planned and could have been at any moment (it’s probably what MetalSeadramon was shooting for), this could explain everything from the partner Digimon arriving in the real world to Imperialdramon losing too easily to Maki having an available D3. Yggdrasil guiding the digidestined toward this result opens a lot of doors. As distraught as Meiko was and as little concern for her life she had shown, the moment Koromon looked ready to throw himself into the crevasse after Taichi, she pulled him into her arms. We discussed this during Reunion, but for all their disagreements they have, Yamato might rely on Taichi’s leadership more than anyone. It’s why he was so bothered by Taichi’s hesitations then, and now with him gone, Yamato recognizes (and likely remembers!) how useless the team is without him. His forceful attitude is jarring and out of character, since he’s trying to lead the way Taichi would. Remember Yamato’s big fight with Taichi in the Dark Masters arc started in part because Taichi refused to let them slow down after losing an ally. I think Hikari pushing back against Homeostasis is one of my new favorite moments in the franchise. She's had more pressure on her than most of the other kids, and I am glad she's sticking up for herself and the others. I am usually glad to see the "chosen one" trope deconstructed like this. Meant to say; "It's not the exact same thing they did with Juri of course..."